I love roasted garlic. I love the texture of garlic cloves after a good roasting: smooth, buttery, sweet, and mellow. Of course, once I start eating roasted garlic I want everyone else the room to do so, as well, lest I be the only one with the pungent breath that alerts the neighbors to what’s on the menu at my house. Eating garlic alone is just anti-social. Eating garlic as a group … well, that’s just bonding. On New Year’s Eve I went nice and simple with our appetizer. I simply roasted a head of garlic and we ate the cloves smeared on garlic herb crackers. Doing so made me realize that roasted garlic is something that I should make a lot more of it as it really is so simple to do and it packs huge flavor. As I happen to have an abundance of garlic on hand at the moment, as well as a number of sweet potatoes (another food that I would send not-so-secret admirer letters to, if such a thing were possible) I decided to see what I could do with the two as an appetizer for the dinner I was making tonight for some friends who just came back on island after spending the holidays on the mainland. This dish was such a hit that we did the revisit after dinner while waiting for dessert! 1. Peel off the papery outer layes of the head of garlic, and cut off the tops of the cloves with a sharp knife. Place the garlic on asheet of garlic large enough to enclose it. Drizzle olive oil and sprinkle salt on the garlic, then wrap it completely in the foil. 2. Bake the garlic and the sweet potato (the potato should be pierced with a fork to allow stem to escape and just placed on a lightly greased baking sheet) at 400F for 35-35 minutes or until both are tender. The garlic may be done before your potato, depending on its size – be sure to keep an eye on them! Let them cool a bit after removing them from the oven. 3. Scoop the potato out of its flesh and squeeze the roasted garlic out each clove and place it all into a food processor along with the maple syrup, olive oil, chipotle hot sauce, salt, and pepper and puree until smooth. 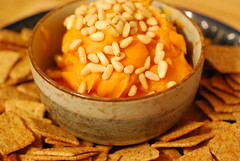 Serve garnished with pine nuts. Spread it on crackers, bread, pita, etc. Ooooo…this looks D-lish! Will be making it this weekend for sure!!! Thanks for sharing! Sounds great–I love roasted garlic too!